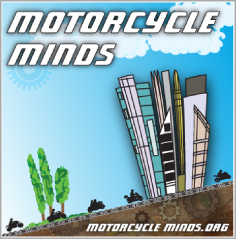 In its latest edition – September 2011 – RiDE magazine has featured an article about the framework regulations on amongst other things, emissions and the safety of motorcycles. 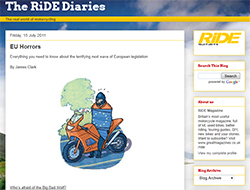 The article by James Clark (which is expanded online in RiDE’s blog site “The RiDE Diaries”) attempts to get an overall grip on the issues of legislation and regulations that motorcyclists across Europe are facing. What makes RiDE’s article on the issue interesting is some good investigative journalism with plain facts without the sensationalistic rhetoric. Although we will forgive the article title, “The terrifying next wave of European legislation” – “EU Horrors” because for many, that is what this legislation is! All the usual suspects of Riders Rights organisations are there giving their take on the issues, from the Motorcycle Action Group (MAG UK), British Motorcyclists Federation (BMF), the Federation of European Motorcyclists Associations (FEMA), Right To Ride, the Association des Constructeurs Européens de Motocycles (ACEM) and Labour MP James Woodcock. James Clark spent over an hour on the phone with us at Right To Ride, asking questions and delving into the complexities of the proposed regulations. This is reflected in the article which draws out not only the main issues but some of the juicier details. 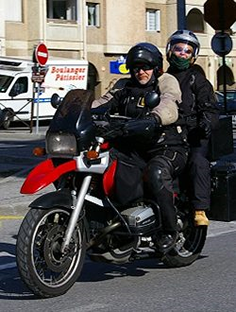 At Right To Ride we are not really motorcycle magazine “aficiondos” and usually browse the “library section” at the local supermarket to see if there is anything of interest in any the of specialist magazines. However in this case, we would like to make a blatant plug for RiDE and having read through this latest issue, it is jam packed with articles and features such as: best kit to buy, projects, where to go and how to RiDE there and so on.